Room Rate in Thai Baht per room per night. Including V.A.T. Government Tax. 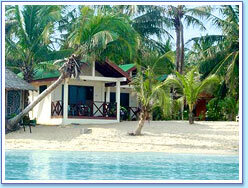 Our three Beachfront Bungalows have a total area of 32 Sq.m and are located just a few steps from the water's edge. They are equipped with king size bed, air conditioning, fridge, hot water shower and safety box. Extra bed 250 Baht . 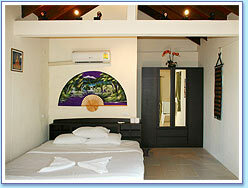 Seaview balcony & private bathroom. Bathroom towels provided & changed daily. 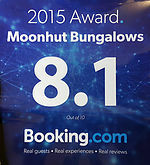 Click here for an overview of all types of bungalow at Moonhut.